This 12 x 8 Waltons windowless overlap shed is a large, durable building. Created with Overlap cladding, once treated it supplies an excellent barrier against the elements. It comes without windows for ultimate privacy and a turn button lock has been fitted to the large double doors to prevent them swinging open in the wind. 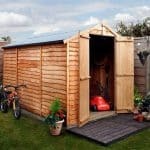 This is a large, private storage shed created with strong overlap cladding. 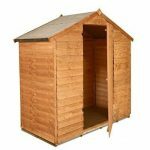 It is constructed with an apex roof fitted with sand felt which helps to give a waterproof design. Water naturally drains down and off the shed, rather than collecting in a gutter. This helps to lengthen its durability, preventing rot and damp from damaging the structure. Apex design roofs also give the interior of a building more head height. This is not only good news for taller people, but it also means you can store, tall, awkward items without worry. Measurements for the roof are 2.13m high, with the eaves reaching 1.57m high. The doors measure 1.65m high and 0.96m wide, while the depth and width of the entire building measure 3.50m and 2.33m respectively. Overlap cladding is featured throughout the shed, helping to create a stable, strong structure. When you look at the panels you will see they overlap similar to how fence panels do. They are easy to assemble which is always an advantage; though there are a few bad points to this cladding that you need to be aware of. You will notice that overlap buildings tend to come at a much lower cost than tongue and groove or Shiplap. This is because they are easier to manufacture and more importantly, cheaper. For that reason they are a popular choice for manufacturers and consumers alike. However, the only problem with this is that while they may be more affordable, they are less durable than other cladding buildings. So this is definitely something you need to keep in mind. To ensure a durable design, Waltons have also given the shed double framed corners. 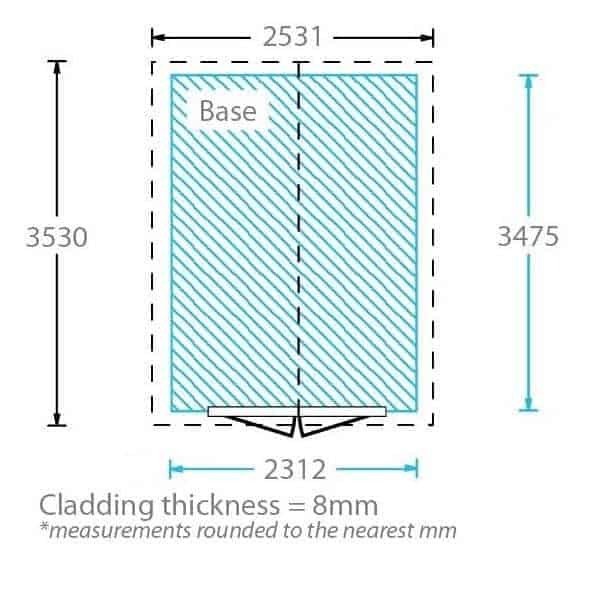 Its overall framing measures 28mm x 28mm which is pretty standard really. A floor is included with the price, but it comes in the form of solid sheet boards. It measures 10mm thick which does give a sturdy feel underfoot, but it is still a little weak. If you want to store anything heavy, we recommend you toughen the floor with the Waltons extra strength floor support pack. Overlap cladding typically needs to be treated annually. This ensures that it is constantly protected against all weathers. Water based treatments tend to be popular because they are cheaper and come in a range of colours. However, as stated in the terms and conditions of the 10 year anti-rot warranty, a spirit based treatment will need to be applied. So what’s the difference? Well a spirit based treatment goes deeper into the timber than a water based one. It penetrates into the wood, forming an impressive internal barrier as well as an external one. 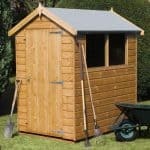 Note that the warranty also requires you to continue treating the shed on an annual basis, or in accordance with the instructions provided by the manufacturer. Double doors are added to the design to ensure maximum space to get in and out of the shed. With A ledge design they enable you to install a staple and hasp. They are fairly heavy so Waltons has also installed a turn button lock, otherwise known as a butterfly catch, to keep them securely closed. For privacy reasons, windows aren’t included. 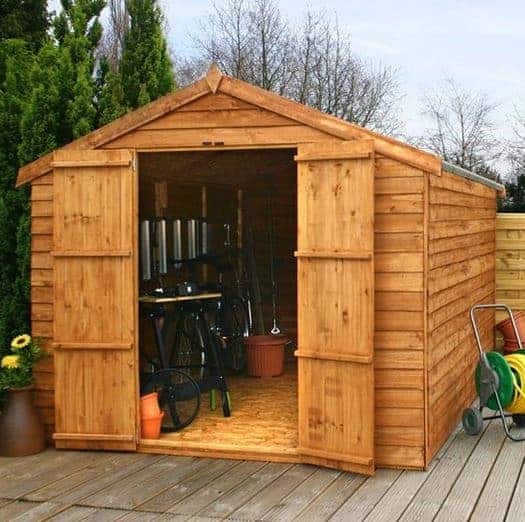 So we recommend this shed if you have a lot of expensive machinery or bikes that you’re going to store. The privacy on this shed is excellent. You can store whatever you choose without having to worry about opportunistic thieves getting a glimpse of what’s inside. This is often deterrent enough for amateur thieves as they have no idea what they might find. If you install an electrical pack in the shed, you also have a nice private working area that you can work in until all hours. Unfortunately the security of the shed could do with some improvements. The biggest problem is the lack of a lock. Don’t let the turn button lock fool you. It isn’t a ‘lock’ as such, it is actually more of a catch. Children may find it difficult to operate but potential thieves will have no problem turning the catch and letting themselves in. So if you do want to make it more secure, it is going to cost you extra, along with the additional work to install the lock. Like most Walton’s sheds, this one gives you two customisation choices. You can opt to upgrade from sand felt to superior duty fiberglass felt. As well as providing stronger protection against the rain, it also comes in a choice of two colours. These include olive green and charcoal. So upgrading gives you the chance to alter the look of the shed slightly. Another upgradable option is the extra strength support pack. Now we highly recommend this. As mentioned earlier, the 10mm solid sheet board does not provide a massive deal of strength. It even looks slightly on the cheaper side. The extra strength support pack drastically improves the durability of the floor, ensuring you can easily store heavy possessions without worrying about it crumbling under the pressure. A 12×8 Waltons Probase is also available. Did you know that if you assemble the shed on an uneven surface, even slightly uneven, it can compromise the longevity of the building? For this reason we advise you to use this extra base to give yourself peace of mind and to get the maximum life out of the shed. We can’t rate the quality of the shed highly enough. We’ve come to expect a high standard of quality from Walton’s and this model definitely didn’t let us down. The longevity of the building is actually pretty good considering it is created with the cheapest type of cladding. That’s because despite its low cost, overlap is actually pretty durable. It does need to be treated however, so this should be factored into its lifespan. As you’d expect, this large building provides a great amount of space. This makes it suitable not just for simple storage, but also as an office or workshop space. The fact you can’t hang heavy items on the walls or add shelving does limit the storage capabilities somewhat, but overall it provides generous space to work with. With 2 people, you shouldn’t find many problems with assembly. However, it is a large building so the panels are obviously pretty large and heavy. Putting it all together is easy, it’s just the hard work and time constraints that lower the rating slightly. We are really happy with the cost of the shed. 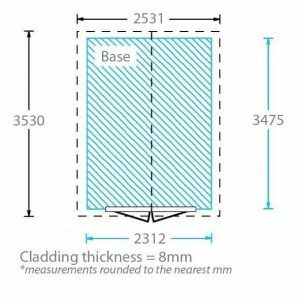 It is almost half price of the Shiplap cladding sheds that come in the same size. 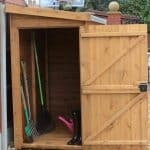 With an excellent amount of storage space and a high quality finish, the shed really does provide exceptional value for money. Final Thoughts: The shed has a dominant, solid look about it thanks to the windowless design. 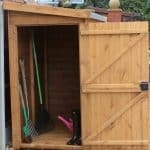 It provides privacy, a safe and dry place to either work or store anything from motorbikes to workshop machinery. Due to its size, you may struggle when trying to assemble the building so it’s worth looking into the Waltons installation service. 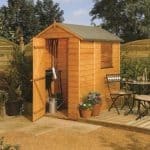 This does come at an additional cost but it takes all of the hard work away, leaving you to simply enjoy your new shed.